The SVG transcoder successfully converted more than 5000 icons from various GNOME and KDE themes. On average the generated .class file with gzip compression is about 30% bigger than the corresponding svgz image. With pack200+gzip compression it's about 40% smaller. The transcoder is available as a simple graphical interface, just drop your SVG images on the window and a Java source file will be generated in the directory of the original image. file The SVG file to transform. Yes, unless a nested resource collection element is used. "default" tries to keep the original file name and tweaks it to make it a legal Java class name (i.e. edit-copy.svg will turn into edit_copy.java). "plain": generates a simple class with a static paint() method. "icon": generates an implementation of javax.swing.Icon. "resizable": generates a ResizableIcon as defined by the Flamingo API. flatten Ignore the directory structure of the source files, and transform all files into the directory specified by the todir attribute. No; defaults to false. verbose Log the files that are being transformed. No; defaults to false. The Ant task is available for download here. 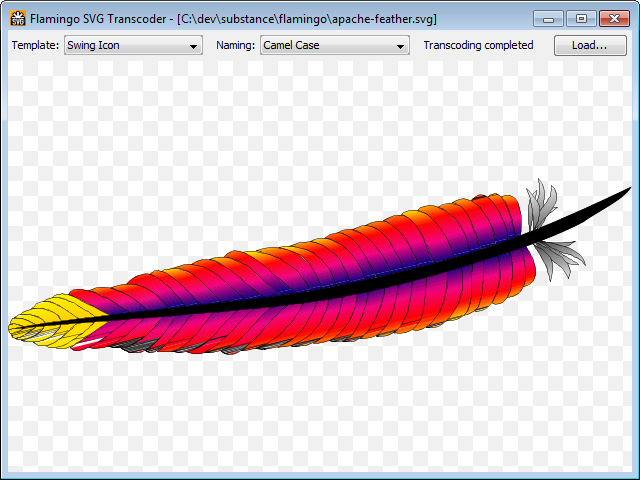 The SVG Transcoder has been originaly developped by Kirill Grouchnikov as part of the Flamingo project (see his blog for more information). It leverages the Apache Batik project for parsing the SVG files.